For a guitarist, or any other instrumentalist for that matter, one of the biggest obstacles is translating the sounds in our head onto our instrument – in our case, the fretboard. Vocalists certainly have it easier in this regard. When you envision a sound in your head, you can readily open your mouth and create that sound. The translation from the mind to the instrument (i.e voice) is effortless and unconscious. Guitarists don’t have it that easy. But we can get there. If you speak to an accomplished jazz player, more often than not you will find that their seemingly inexhaustive ability to improvise on the fly comes from being able to play the lines they are hearing in their head. So how do you get started on this path to musical expressiveness? With ear training! Ear Trainer is a free, web-based tool with useful features such as tempo adjustment, and automatic scoring just to name a couple. 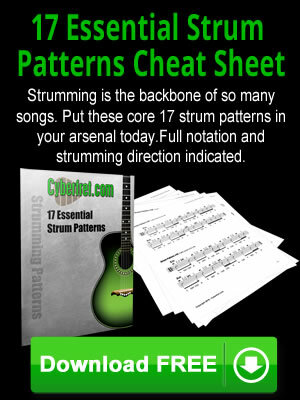 You will notice that there are a variety of ear training categories – intervals, chords, scales, etc. We are going to focus on intervals, since they are the fundamental building block for scales and chords. When just starting out, it is best to keep the “fixed root” option checked off. With this option, the intervals you hear will always start with the same note. This way, you will really get a feel for the differences amongst the various intervals. Are you ready? Let’s get to it then. 1. Prime – the most basic interval, this is simply the same note played consecutively. 2. Major 3rd – this interval contains 2 notes spaced 2 whole steps apart (such as C to E, G to A, etc), and has a familiar uplifting, happy quality. 3. Perfect 5th – this interval spacing is 3 1/2 steps (C to G, G to D, etc). 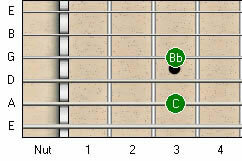 The so called 5-chords (C5, D5, etc) used extensively in rock and roll are based on this interval. 4. Octave – this interval consists of the same two notes played an octave apart. The key to developing a good ear is to come up with your own meaningful associations. You need to make it real. One of the best approaches is to associate each interval with a familiar tune. For instance, when I hear a major 3rd, I think of the “Star Spangled Banner”. At the beginning, the words “say can” are a major 3rd apart. Likewise, I have a unique association for the perfect 5th. I think “Top Gun”. Remember that really nice, melodic guitar instrumental in that movie? The one played by Steve Stevens? Those first two notes are a perfect 5th apart. “Star Wars” may be more familiar. The first two notes of that famous theme are also a perfect 5th apart. So you get the point. Each interval needs to be personal for you. They need to evoke a response. When you are correctly identifying a majority of the simple intervals, it is time to move on to more difficult exercises. Ultimately, you want to end up at the “chromatic intervals up/down” exercises, which you will see after clicking the “Intervals” link. Furthermore, you should deselect the “fixed root” option, so that you become accustomed to identifying intervals across a wide tonal range. Before we talk about identifying intervals, let’s take a look at how intervals appear in standard notation and on the fretboard. In what follows, “m” stands for minor, “M” is major, and “P” is perfect. 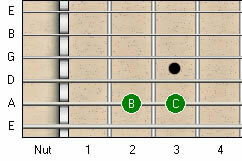 The image below shows one possible layout of the intervals in TAB notation. You should be aware that because of the guitar’s ambiguity (i.e. identical notes appearing in multiple locations), there are a variety of possibilities. 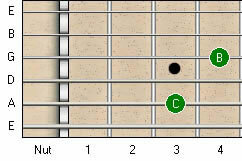 And most importantly, you should realize that even though this example shows the intervals starting from C, the patterns remain the same anywhere on the fretboard, regardless of the starting note. Regarding the standard notation, note how each interval is a half step higher than the previous one. This gives rise to the term chromatic intervals. Now that you understand how the various intervals are defined, you are ready for the challenge – learning to recognize them! Here is a list of all the intervals that you will need to be able to identify in the “chromatic intervals up/down” exercises. I have added comments about each interval, which will help you identify them by sound. Prime The prime interval, also known as the unison, is simply 2 identical notes. m2 Recognized as the ominous “Jaws” theme! Also the beginning of the main melody from “Für Elise”. M2 Think “Happy Birthday”. The 2nd and 3rd notes comprise a M2 (i.e. the last syllable in “Happy” and the first syllable in “birthday”). m3 My association here is from one of my own songs (that is the best way to associate – create your own music!). I also associate it with the first 2 notes of the most popular scale in rock music – the Pentatonic Minor. 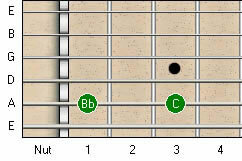 For instance, with G Pentatonic Minor, the G to Bb is a minor third. M3 As mentioned above, I think about the words “say can” (as in “Ohh say can you see”) in “Star Spangled Banner”. P4 I associate this with Mozart’s “Eine Kleine Nachtmusik”, whose opening 2 notes comprise a P4. Another good example is “Here Comes The Bride”. The words “Here comes” constitute a P4. Tritone This interval goes by many names, but I think tritone is the most useful name in the context of tritone chord substitution (which I will get around to talking about sometime!). I don’t have any song associations with this one. I simply associate it with the characteristic sound of diminished chords and arpeggios – namely, a very ominous, haunting sound. P5 Like I mentioned earlier, I associate this interval with the first two notes of “Top Gun” theme. If you don’t know what I am referring to, then just think about the first two notes of the famous theme from “Star Wars”! m6 This interval reminds me of the song “The Entertainer”. If you don’t know the song by name, then you surely know it by sound. I suggest listening to this song. The very familiar opening, with the series of repeated notes, make up a m6. M6 I don’t associate this interval with a particular song. Instead, I am instantaneously reminded of a lick that is very common in blues music. Just play this interval and I think you will see what I mean! And so it has the quality of a M2 interval, and I associate it with the m7. And so it has the quality of a m2 interval. Octave An octave is similar to the prime interval, except that the notes are an octave apart. The first two notes in “Somewhere Over The Rainbow” are an octave apart. m9 Don’t be thrown off by these so called extended intervals. These are a breeze. The m9 sounds just like a m2, except the upper note is played an octave higher as compared to a m2. So the quality is identical! M9 Just as the m9 is identical in quality to the m2, the M9 is identical in quality to the M2. You are now well armed to tackle the “chromatic intervals up/down” exercises. These will be considerably more difficult than the simple exercises, but by using the above information you may surprise yourself at how quickly you make progress! That concludes this article. I hope some of the concepts that I have discussed become truly meaningful as you pick up the guitar and apply them. You may not appreciate it a day or two later, but if you stick with it for at least a month, I think you will find that the portion of your mind dedicated to music has expanded! ©2003 Guitar Dreams. All Rights Reserved.